The name says it all!! 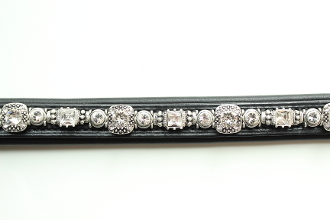 - Dog Collars with Bling from Browbands with Bling! These exquisite Signature Dog Collars are carefully hand-crafted here in the USA from high quality materials, such as Swarovski crystals. These elegant “one of a kind” designs will set your pooch apart! Prices range from $50.00 to $140.00. Prices are based on size and width of collars. Mini collars are available from 8"-18" and Regular Collars are available from 12"-26". Custom sizes are available. Made from the finest quality leather, stitched and glued for durability and padded for your dog's comfort. Customers have the ability to customize the color and design of each collar.There is no fee to customize your collar. whether it be a Dog Leash, Belt, Browband, Leather Bracelet or a Halter. To order ANY products that were on the original website.... please visit www.browbandswithbling.net and call with your requests.